Bobby Brown, the youngest member of New Edition, was born on February 5, 1969 in Boston, Massachusetts. Bobby was also one of the first three members of the group. As a child, Bobby enjoyed hip-hop and rap music and buying clothes. Some people he admired were Grandmaster Flash and Rick James, and he is also a big Elvis fan. Bobby has also always been interested in boxing, and he even got accepted to the Golden Gloves when he was eleven. Bobby started out as a DJ with Ralph Tresvant, and the two were known as Click and Clack. He later joined a group called New Edition, which Ralph Tresvant also joined later. The group performed in countless talent shows and was discovered by Maurice Starr a few years later. Though New Edition was a major success, Bobby felt the need to go his own way. He once said, "Even when I first started out, I always wanted to be a solo artist." Bobby told the other group members that he wanted to pursue a solo career in a hotel room during New Edition's Fantasy Tour. They were surprised and saddened by the news, but they understood and would welcome him back anytime. Bobby then released his debut solo album titled King of Stage. The first single released from the album was "Girlfriend." Though Bobby was not an instant success with this album, his second album made him one of the biggest R&B stars of the 80's. Bobby released Don't Be Cruel, his second album, in 1988 - the same year New Edition released Heart Break with Johnny Gill, who was Bobby's replacement. Don't Be Cruel also made Babyface and Teddy Riley popular as artists, song-writers, and producers. Not only did Don't Be Cruel help the careers of Bobby, Babyface, and Teddy Riley, it also introduced a new sound to the music industry. This new sound, known as new jack swing, was a hip-hop rooted style of R&B crooning and is still used by many musical artists today. Bobby has performed in many songs and videos other than his own. 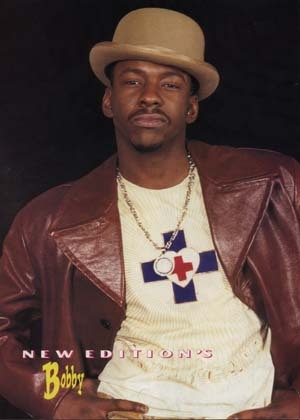 He and his brother Tommy appeared in the long remix version of Ralph Tresvant's "Sensitivity" video, and Bobby was also featured in Ralph Tresvant's song and video "Stone Cold Gentleman." Bobby and Ralph both were also on the beautiful song and video "Voices That Care," which featured artists such as Peter Cetera, Garth Brooks, and Celine Dion. He also made a guest appearance on the Melba Moore song and video "Lift Every Voice and Sing." Bobby sang "We're Back" and a song that became a huge hit called "On Our Own" on the Ghostbusters II soundtrack and also appeared in the movie as a bellboy. He has also made cameo appearances in movies such the movies A Thin Line Between Love and Hate and Panther. In 1990, Bobby performed with the other five members of New Edition at the MTV Video Music Awards. It was the first time all six members had performed together at the same time. Together, New Edition sang "Mr. Telephone Man," which was originally recorded without Johnny, as well as "If It Isn't Love" and "Can You Stand The Rain," two songs that Bobby never recorded with New Edition. In 1992, the Bobby album was released. With this album, Bobby's list of hits grew with the smash songs "Humpin' Around" and "Good Enough." Bobby released Remixes In The Key Of B, his second remix album, in 1993. It did not do as well as his first remix album, , but it featured two tracks that are not available anywhere else called "I Want You, I Need You" and "She's My Lady." Bobby also had another album that was released only released in the UK called Hits Remixed. In 1996, Bobby joined Ronnie DeVoe, Johnny Gill, Ralph Tresvant, Michael Bivins, and Ricky Bell for the long-awaited New Edition reunion. Although Bobby was not an official member of the group by contract, fans were thrilled to see New Edition with all six members. In fact, they were so thrilled that New Edition's reunion album Home Again topped the charts, even knocking out groups like R.E.M. from the number one spot. However, Bobby left the group once again, stating that he hates them and would never work with them again. In contrast to most recent statements by Bobby, an issue of Vibe magazine said that Bobby would indeed work with the group again. As the song "Home Again" from New Edition's reunion album goes, "Will our story end like a fairy tale or just another heart break? Only time will tell...," only time will tell if Bobby really will work with New Edition again or if he will cause another heart break for fans. Forever, Bobby's latest album, Forever, was released in late 1997 and was probably his least successful album, or one of his least successful albums, released in the US. Perhaps one reason it didn't do as well as it could have done was because he lost respect from many fans after the comments he made about New Edition. Bobby is supposedly working on a new album that is due out next year. The question still remains of whether or not he will participate in the next New Edition reunion.